TradeLawGuide has nine research tools that enable you to research WTO legal issues in a comprehensive, methodical and efficient manner. The Subject Navigator is an innovative index that serves as a gateway to the subject matter of the specific provisions of WTO agreements and instruments and of certain key subjects that do not fall within specific provisions (e.g., burden of proof). Information is methodically indexed alphabetically and, for complex subject matter, it is presented in the form of an electronic textbook. All content is linked to the texts of the agreements, instruments, jurisprudence or other documents. Major Strength: If you do not know which provisions of the WTO agreements and instruments are relevant to your research or if you are researching a core subject that is not found in the provisions, the Subject Navigator is the best starting point for your research. In addition to identifying provisions that are directly relevant to your research, the Subject Navigator identifies provisions that address similar subject matter in other contexts that may be indirectly relevant to your research. This research tool provides fully annotated texts of WTO agreements that have a large body of WTO jurisprudence. The annotations include TradeLawGuide's' Article Citator, Jurisprudence Citator, issue content from WTO jurisprudence, cross-references, incorporated instruments, procedural documents, negotiating history, and precursor texts. Content is linked to the full text of referenced documents. In limited circumstances (e.g., where documents are voluminous or inclusion is not possible due to intellectual property considerations) links are provided to external sites. This tool also includes the texts of other WTO agreements and instruments with links to Article Citator, Jurisprudence Citator, Negotiating History and Precursor Agreements. The annotated agreements are texts are fully indexed in the Subject Navigator. Major Strength: The Annotated Agreements provide comprehensive research content on specific WTO Agreements. They incorporate all of the innovative features of TradeLawGuide. Their value lies in the breadth of content, the level of detail, and the methodical structure of the annotations which are organized by subject matter. Other value-add attributes include the treatment of annotated terms, whereby terms elaborated upon by jurisprudence in one context are annotated in all other contexts within the agreement. 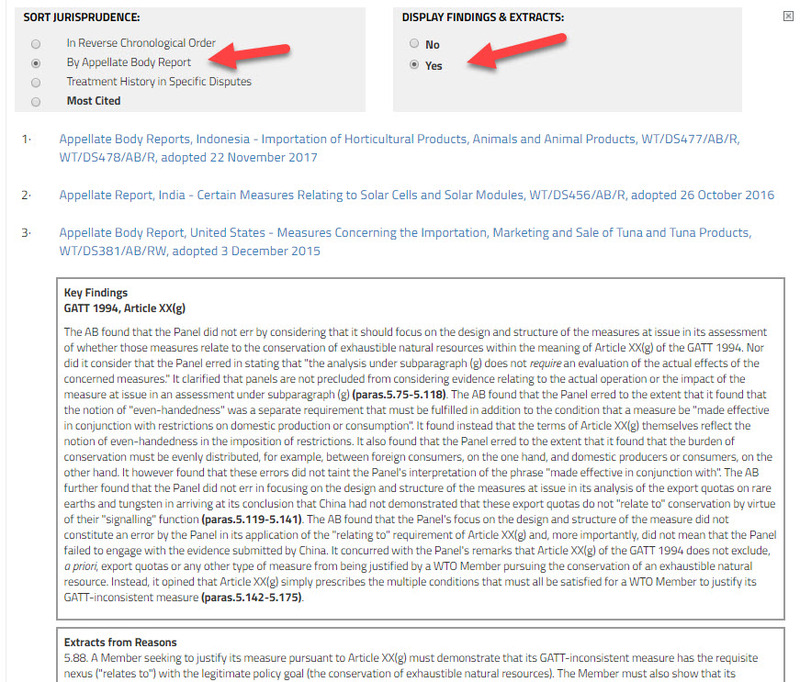 An innovative search tool enables you to search the content of the annotations to find subject matter when you are not sure which provision of the agreement is relevant. The Article Citator provides value-added references made in WTO jurisprudence to a specific provision of any of the WTO agreements and instruments as well as pre-WTO agreements and the Vienna Convention on the Law of Treaties. Single click pinpoint access enables you to quickly browse through these references. It displays WTO jurisprudence relevant to a provision without having it filtered through annotations. Major Strength: The Article Citator enables you to undertake more comprehensive research and substantially reduces the possibility that you will miss relevant jurisprudence on a particular point of WTO law. It is helpful when researching issues that might be addressed in the periphery of existing jurisprudence. You can also quickly find references to provisions that are not readily apparent because they are made in the context of analysis and reasoning concerning other provisions. The Article Citator provides concise summaries of the main findings in jurisprudence along with text extracts where particularly relevant statements are made concerning the provision in question. It captures references that are difficult to find using a full text search. For instance, the Article Citator captures all forms of Article 3.2 of an agreement, that is, "paragraph 2 of Article 3", "Article 3, paragraph 2" and "paragraphs 1 through 3 of Article 3" and it takes you directly to those references with a single click. There are four options for displaying the data in the Article Citator: (i) "reverse chronological order" shows you the most recent jurisprudence concerning a provision; (ii) "by Appellate Body Report"; (iii) "Treatment History in Specific Disputes" which allows you to follow the interpretation of a provision through a dispute's' various phases (e.g., panel, appeal, compliance panel, appeal); and (iv) "Most Cited" to give you an indication of the importance of a particular paragraph or footnote reference in the citator. There are also options to display the key findings and extracts from reasoning relating to a particular provision. In addition to being included in the annotations, the Article Citator is presented as a stand-alone tool. This enables you to see at a glance which provisions of a particular agreement or instrument are being cited and by how many reports, awards and decisions. The Jurisprudence Citators enable you to quickly ascertain the status of passages in WTO jurisprudence and "update" or "note up" passages methodically and efficiently. Major Strength: The Jurisprudence Citators enable you to quickly evaluate the status of passages in jurisprudence and any nuances created by subsequent Appellate Body, panel and arbitrator statements regarding the passages. They provide you with a high degree of confidence when relying on jurisprudence. Given their importance, the Jurisprudence Citators are integrated into the Article Citator and into the integrated browser so you can instantly update all jurisprudence references made in the database. The WTO Jurisprudence Citator provides pinpoint references made in WTO jurisprudence to paragraphs and footnotes in previous WTO reports, awards and decisions. The GATT 1947 Jurisprudence Citator provides pinpoint references made in WTO jurisprudence to GATT 1947 and 1979 GATT Code reports. The Treaty Interpretation tool provides you with the provisions and jurisprudence encompassing the rules of treaty interpretation applicable to the WTO agreements and instruments. These are Articles 31-33 of the Vienna Convention on the Law of Treaties, Article 3.2 of the Dispute Settlement Understanding, Article IX:2 of the WTO Agreement and, in the case of anti-dumping measures, Article 17.6(ii) of the Anti-Dumping Agreement. Major Strength: The Treaty Interpretation tool provides you with quick access to the rules of treaty interpretation, as elaborated upon in WTO jurisprudence, needed when interpreting WTO agreements and instruments. 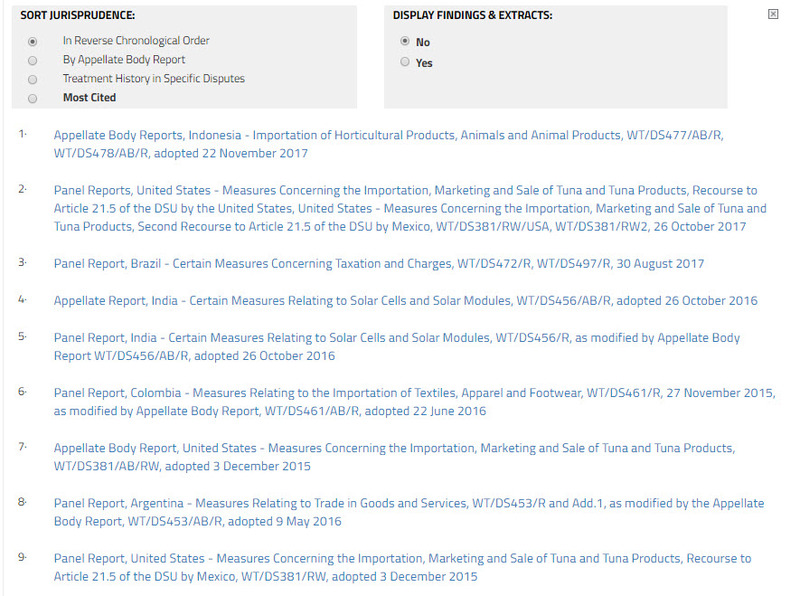 This research tool provides information on terms and phrases defined in the texts of the WTO agreements and instruments or elaborated upon in statements in WTO reports, awards and decisions. Major Strength: Terms & Phrases enables you to see at a glance where a particular term or phrase has been expressly defined by an agreement or instrument or where it has been considered or commented upon in WTO jurisprudence in a way that illuminates its meaning. It allows you to look across agreements and instruments to ascertain whether a term or phrase interpreted in one context has value for understanding the same or a similar term or phrase used in another context. It also captures terms that would be difficult to search using a full text search (e.g., "a", "or", "and", "and/or"). Dispute Settlement Body (DSB) minutes contain discussions of policy and other issues that arise in respect of WTO jurisprudence (reports, awards and decisions). If you intend to rely on a particular report, award or decision it is prudent to review the DSB minutes to determine if any policy or other issues have been expressed concerning that jurisprudence. Major Strength: The DSB Minutes tool enables you to quickly determine the nature of any criticisms or policy concerns that were expressed to the DSB concerning jurisprudence that you intend to rely upon. Jurisprudence Pending provides information on ongoing disputes for which reports, awards or decisions are pending that may address WTO provisions that you are researching. Major Strength: This tool enables you to quickly ascertain whether the provisions you are researching are the subject of an ongoing dispute and provides quick access to relevant documents pertaining to the treatment of the provisions in that dispute. This component enables you to conduct full text searches using various methods, including boolean routines. You can search all categories of documents or narrow a search to a specific category or select categories. Various filters are also provided to further narrow your search. Major Strength: The Full Text Search covers all documents in the TradeLawGuide database. Document selection options and filters (which include a filter based on the content of the Article Citator) enable you to narrow your search to improve the quality of the results. The content of Terms & Phrases is integrated to give you the most relevant results fast. Instead of having to review thousands of results from searches of words like "proceedings", you will be directed to the result that is on point. The Full Text Search also provides extracts of your search results. These extracts can be viewed at your option or you can go directly to the relevant parts of the documents you are searching. The Jurisprudence Directory provides a directory of all WTO reports, awards and decisions that have been circulated to the WTO Members and thereby made public. It also provides a directory of GATT 1947 and GATT Code jurisprudence. The texts in this directory are in their original format and are complete (in contrast to the optimized and redacted texts that are used in the integrated PDF browser in the research tools). Major Strength: The WTO jurisprudence directory provides instant access to the complete texts of WTO reports, awards and decisions along with summaries and a link to all of the procedural documents circulated in a dispute. You can sort the documents using various options to quickly find the documents that you need. The Documents Directory provides a directory of procedural documents (i.e., dispute settlement documents other than reports, awards and decisions). Documents can be displayed by dispute or their display can be customized using various sort options. Major Strength: The Documents Directory enables you to quickly find precedents for over 50 procedural document categories to assist in your drafting. Documents can be sorted by category and by provisions referenced within the documents. TradeLawGuide’s collection of Uruguay Round negotiating documents currently encompasses approximately 1700 documents. These documents include the principal negotiating texts and key working group documents. TLG is in the process of adding more documents to the collection. Major Strength: This download facility provides a detailed list of negotiating documents to inform you of what is available. Approximately 1700 of those documents are currently available for download. Various sorting functions enable you to quickly browse documents that could be relevant to your research. For easy viewing, the documents have been converted into Adobe PDF format. To the extent possible, key information is either displayed or one click away. All research content links to the relevant part of PDF format source documents (e.g., paragraph, footnote, page) using an integrated PDF viewer. This viewer is used throughout the database for the research tools and document facilities. It enables you to quickly consult the relevant parts of source documents. Original source documents are readily available and easy to browse. References to WTO jurisprudence include a brief summary of the key findings, extracts where there are particularly relevant passages in the references and a link to the Jurisprudence Citator so that you can "update" or "note up" the passages of interest to you by ascertaining whether, how and where they have been considered in subsequent WTO jurisprudence. Major Strength: To reduce research time and improve efficiency, the integrated browser displays the most relevant information on your screen or only one click away. Have you ever wondered what the difference is between disputes labeled similarly but not identically, such as Canada – Milk and Canada – Dairy? It turns out there is no difference. If you are reviewing WTO jurisprudence or other documents that use informal short titles to refer to WTO jurisprudence and you need to ascertain the full title or you have the full title and need to ascertain the informal short title, the Citations tool can help. The tool includes "official" WTO short titles as well as other short titles that have been used in WTO jurisprudence. Major Strength: Eliminates the need to waste time ascertaining the short or full titles of a report, award or decision.